For those who pride themselves on being as fly as they are high, these luxury brands incorporate equal amounts of style and stoner. Alexander Wang is one of the successful names in fashion today, most known for his luxe, edgy takes on high-fashion streetwear. But in 2016 Wang turned heads and over a new leaf, quite literally, when he unveiled his FW 2016 Ready-to-Wear collection during New York Fashion Week. The collection arguably set a precedent for 2017: Luxury fashion designers giving a ‘haute’ take on weed-inspired designs and sending them down the runway. Wang’s FW 2016 collection was complete with dresses etched with lace ganja leaf in-sets, as well as mini weed leaf-patterned bucket bags. But it was his tenth anniversary and NYFW after-party that solidified him as today’s biggest name in fashion to advocate for the legalization of cannabis on and off the runway. 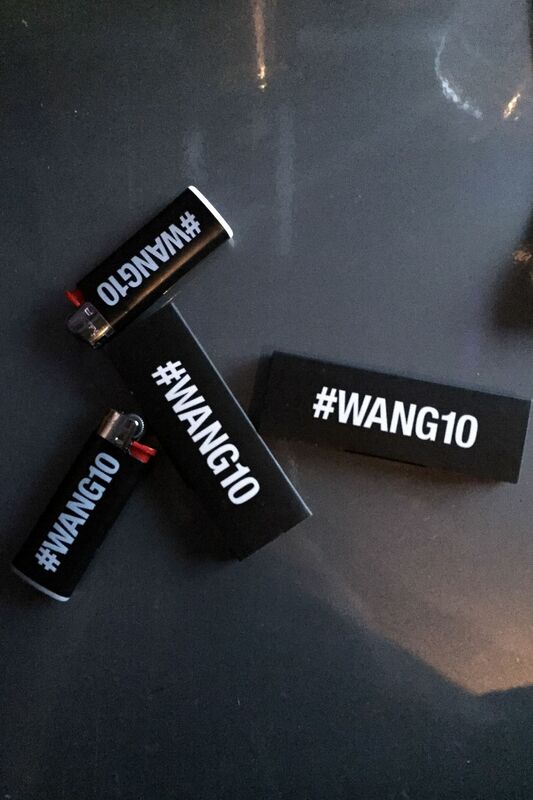 What other fashion designer do you know who gift their guests and party-goers with #WANG10 rolling papers and lighters? For the individuals who pride themselves on being as fly as they are high, these next five high fashion brands have recently integrated weed motifs and cannabis culture into their latest collections for fall and spring 2017 — from weed leaf intarsia designs on fine cashmere to luxury takes on everyday marijuana accessories, and much more. Fashion designer Lucien Pellat-Finet, aka the “King of Cashmere,” completely reinvents how we think about high-end fashion by designing playfully chic garments that embrace modern style and pop culture. His runway show for the Lucien Pellat-Finet FW 2017 collection featured a sweater with Minions on it in anticipation of the release of Despicable Me 3 this summer; Lucien Pellat-Finet collaborated with The Simpsons again for its latest capsule collection, and the designer has worked with many fine artists, too. “My clothes are about moderation and style rather than being fashionable. I don’t want to be caught in fashion where you’re defined by your last design,” Pellat-Finet has said. And though the French designer has crafted fine cashmere sweaters since the 1990s, Pellat-Finet just recently held its first-ever runway show during Paris Fashion Week. Lucien Pellat-Finet is most notable in the world of fashion for combining pop art and intarsia design symbols on 100% fine cashmere sweaters and fashion accessories. His FW 2017 collection didn’t disappoint longtime fans of the designer’s fearlessness as he embellished his garments with motifs like the marijuana leaf and skull and crossbones. Pellat-Finet’s first runway collection might as well have been an homage to marijuana. The event was certainly 420-friendly as models strutted down the catwalk rocking t-shirts outlined with a weed leaf and the word Pharmaci printed above. One model even wore a sweatshirt that read Enjoy Ganja front and center. In other words, Pellat-Finet isn’t shy about his admiration of the cannabis plant. In an online interview, Pellat-Finet was asked why he chooses to feature marijuana leafs in his designs and he responded by saying, “[weed] is provocative.” In another interview, he admitted that his infatuation with ganja is in large part due to his firm belief that weed is a symbol of freedom and should be legalized everywhere. To shop Lucien Pellat-Finet online click here. Pamela Skaist-Levy and Gela Nash-Taylor are known as being the ingenious design duo behind Juicy Couture, infamous for the brand’s casual-chic velour tracksuits that were popularized in the early aughts by Hollywood “it girls” Paris Hilton and Nicole Richie. Juicy Couture quickly became the must-have designer brand in every wealthy middle schooler’s wardrobe, a uniform for prowling the mall. Skaist-Levy and Nash-Taylor sold Juicy Couture to Fifth & Pacific — then Liz Claiborne — in 2003, but the ladies continued to lead the brand as co-presidents. It wasn’t until 2010 (three years prior to Juicy Couture being sold again, this time to a licensing company for $195 million dollars) that Skaist-Levy and Nash-Taylor decided to step down and away from the Juicy Couture brand completely. After leaving Juicy Couture, the ladies still yearned to design stylish, everyday wear for the jet setting woman who doesn’t want to have to compromise comfortability over luxury style. The duo re-emerged on the fashion scene with their line Skaist-Taylor in 2011, and it has since been renamed Pam & Gela. But longtime fans of Skaist-Levy and Nash-Taylor’s designs during Juicy Couture’s prime era need not worry; the dynamic duo is still bringing that luxe athleisure and California vibe to Pam & Gela. The fashion designers went from “That’s hot” to “That’s haute” when they debuted the Pam & Gela SS 2017 Ready-to-Wear collection during New York Fashion Week this past February. One of the highlights of their SS 2017 collection were silk embroidered bomber jackets, including one eye-catching bomber that featured a tiger surrounded by what appear to be marijuana leaves. Pam & Gela have stayed true to their LA roots, too. To celebrate the upcoming holiday these ladies designed a 4/20 Frankie tee. It says “Live Fast Burn Slow” and features a weed leaf emblazoned on the front. It’s the perfect tee to rock during your 420 festivities. Pam & Gela SS 2017 can be purchased here online. Paris-based unisex fashion line Vetements is known to push the envelope with its cutting-edge and daring designs, as well as the cocky-brilliant attitudes of its creative team. For example, after last November’s election, Vetements released necklace pendants that doubled as weed grinders. But this wasn’t the first-time the brand experimented with the basic essentials found in every cannabis consumer’s kit of accessories. Before dropping our jaws with their stylish grinders, Vetements introduced us to ankle boots with lighters for heels. Well, not actual lighters, but at first glance you’d think the heels were a classic Bic. You can keep it lit and purchase Vetements Lighter Sock boots here. Edie Parker is an American brand of vintage-inspired clutches and handbags. Since it was founded in 2010, A-list celebrities like Taraji P. Henson, Kate Hudson, and Emma Roberts have flaunted stunning Edie Parker clutches on the red carpet. In 2016, Heyman introduced the Edie Parker SS 2017 collection during New York Fashion Week, including clutches and totes that come in a variety of bright pastel hues. One highlight from the collection is the rose-colored marbled acrylic clutch with “weed” inscribed on it. Along with the weed clutch, the Edie Parker SS 2017 collection features a golden pearlescent dirty clutch and herb clutch. The Jean Weed clutch by Edie Parker can be purchased online. Ottolinger is an emerging Berlin-based fashion line founded by Christa Bösch and Cosima Gadient a couple years ago. The design duo is most known in the fashion industry for combining grunge and streetwear aesthetics to create amazing couture pieces. Bösch and Gadient presented their FW 2017 collection during Paris Fashion Week, and the collection featured distressed and deconstructed pieces that completely defy norms of how we think about and perceive haute couture. For example, their latest collection is filled with couture pieces that were burned, ripped, or torn. Highlights from the collection include a long-sleeve sweater and sleeveless top with the infamous weed leaf motif embroidered on each. Remaining faithful to the brand’s aesthetic, Bösch and Gadient paired the weed leaf sweater with deconstructed bottoms, half made of denim and the other shorts, giving an entirely new meaning to mixing and matching “high and low” pieces. So far the young designers are staying true to their free-spirit and IDGAF attitude as they increasingly become known for turning heads in the fashion industry. You can purchase Ottolinger here. Who are some of your favorite fashion designers and brands that have highlighted cannabis and cannabis culture in their designs? Let us know in the comments.